Would you put green tomatoes in your dessert? How about basil or coriander? If you’re cringing, you’ve got to meet Jehangir Mehta, the pastry wizard who’s created quite a buzz in Manhattan. As pastry chef at Aix where the noted French chef Didier Virot holds court, Mehta has turned the concept of dessert on its head. No namby pamby, wishy-washy vanilla scoops with chocolate sauce for him. This Bombay native takes diners where they’ve never been before, on a wild ride full of new taste sensations, adding a whole spectrum of unlikely spices and ingredients that leaves them clamoring for more. Indeed, that is the special skill of Mehta, orchestrating unlikely pairings and creating a taste that is vibrant and refreshing, something that didn’t exist before. If it’s springtime, you’re likely to even find fresh flowers in his light and airy desserts. 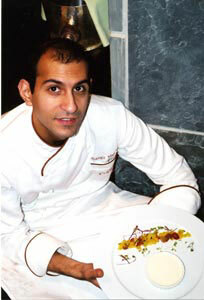 Mehta has been a pastry chef in some of the most talked about restaurants in New York City, including Jean Georges, Union Pacific, Virot, Compass and Aix. He also runs Partistry, a bakery where the selection includes the Kama Sutra chocolates that are flavored with four different aphrodisiacs – fennel, jasmine, papal and beetle nut. His pet peeve? People who eat elaborate seven course meals and when it comes to dessert, settle for a scoop of vanilla ice cream with chocolate sauce! In a small bowl mix the basil seeds with the green mango. 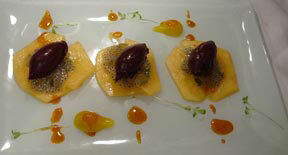 In the cavities of the 3 circles put the basil seeds and green mango mixture.